Inundated with too many job applications to handle, companies of all sizes are routinely turning to the ATS–the Applicant Tracking system–for help. Frustrating as it is for the job seeker, this ATS has become one of several strategies companies use to electronically and quickly screen resumes for open positions. So the savvy job seeker today must understand the ATS and then design a resume that can be as ATS proof as possible– to have a fighting chance of nabbing one of the coveted job interviews. And maybe the job. An ATS is not inherently bad, though, as our keynote speaker Jackie Schierenberg explained to attendees. But last year Dignity Health reviewed over 550,000 resumes, so they regularly use the ATS. 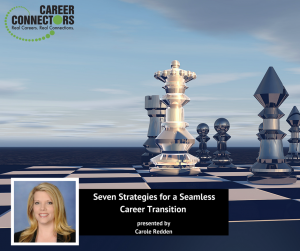 She came to Scottsdale Career Connectors to give job seekers tips for getting noticed during the job hunt—including getting past the ATS screening. Working for Dignity Health for 14 years, and in Talent Acquisition for over 20 years, Jackie leads her current team of 10 to fill both those hard-to-fill positions as well as leadership positions. Her team scours the internet in search of talent. The ATS has become a very important tool. Leave out what used to be called the “objective” section on a resume. Instead, spend time describing how you add value to the company. Use active verbs. The Skills section is THE most important section from the standpoint of the ATS. Do your homework. Create your resume carefully. For example, find out if the company you’re targeting uses the term “nurse” or “RN” so the ATS system understands you. Make sure you’re using the recent lingo of the industry–or of that company in particular. Read the minimum requirements and then make sure you use key words on your resume to describe–in those terms where possible– your qualifications. Font type— Don’t get fancy or the ATS might not recognize what you’re saying. Same with bullets. Sometimes ATS can’t read PDF files so consider submitting just a regular MS Word file. Remember– Recruiters can specifically target the experience section. It’s Jackie’s favorite place to search. So craft this section carefully. As a recruiter, she’s paid to be on the phone, so she advises–be bold–call recruiters and hiring managers. Jackie said she will take your call even if it’s only five minutes and at least give some advice. As part of your homework, find hiring managers via linked in and then google to find their phone numbers. Cover letters can be great, but integrate them into one document that includes the letter and the resume. This forces the reader to look at the cover letter. It’s not reviewed like a resume, but if there’s something compelling that’s not in your resume, then include it in your letter. As a recruiter, Jackie says she reads very few cover letters. But there are always exceptions. Her husband included a cover letter to explain why he went into architecture. I believe he got both the interview and the job. Dignity Health uses an ATS that can search the resume, the attachments, and experience sections. The ATS system looks for specific “hard” job skills. But not soft skills. The company will figure out your soft skills in the interview. Number of pages in a resume. Just be sure your experience on the resume is recent or relevant. She doesn’t believe in a limiting one-pager resume. Instead, she suggests you include enough to get the point across. Address versus no address on the resume. She sees many resumes without addresses. She personally doesn’t include an address on her resume, but her cell phone indicates where she lives anyway. With pre-screening questions, distance from work is often revealed; in nursing, for example, at times a nurse might be required to come to the hospital within 30 minutes after being called. So location becomes important. Dignity doesn’t use a personality test as part of the application. That tended to bog down the application process for them. But Dignity relies heavily on the behavioral interview instead. Jackie tells us the company she works for, Dignity Health, doesn’t use robots—yet. But they use the ATS. And as they say, ATSs are definitely trending now. 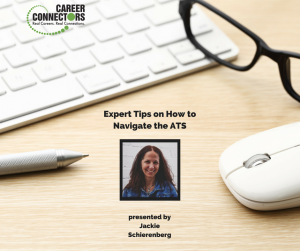 Jackie advises job seekers to be prepared and realize ATS systems are being used by many companies of all sizes. She recommends you design your resume with the ATS in mind so you’ll be able to compete for that dream job. Bank of the West has a location in Tempe starting in October of 2017, but employs 10,500 team members across 23 states, servicing over two million customers. Open positions span a variety of areas including managers and analysts, customer service, Admin/Human Resources, accounting, IT, and loan officers. The company prides itself on a diverse culture, encouraging team members to share their voice/opinion to help advance the organization. The company offers several benefits including complete medical, tuition reimbursement, generous paid time off, company holidays, and discounted banking rates. For more information on the company or to apply, visit their website. IMPACT Payments Recruiting has been around since 2000, focusing exclusively on the payment and cards industries worldwide. They specialize in working with senior to executive-level roles, both on a permanent and contract basis. They employ 15 in-house employees across the U.S., with more than 130 contract employees in Arizona. IMPACT works within every area including product, sales, marketing, compliance, IT, and operations. Many benefits to working with IMPACT include the company working closely with you throughout the entire process including resume prep, interviewing, and salary negotiations. IMPACT has many contacts in place with companies in the Valley, and those offering remote work. Current openings include VP of Technology, Account Manager, Sr. Web Developer, Sr. Risk and Credit Specialist, Director of Underwriting, Sr. Director of Risk, Net Developer, Data Scientist, Sr. QA Automation Engineer, and Technical Architect. For more information or to contact them, visit their website. Send your resume and one of their executive recruiters will contact you. Allstate offers a variety of insurance products throughout the United States and appears #84 on the Fortune 500 list. The company has over 10,000 Alllstate Agency owners. The company always seeks employees in information technology, HR, product, claims and sales management, plus exclusive financial specialists, agency owners, and licensed sales producers. Advantages to owning your own Allstate Agency include no franchise fee (though there is a startup investment) and the ability to leave the business to heirs. Because Allstate is a national brand, agency owners benefit from the big marketing plan which gives credibility to their individual offices. For anyone who has no insurance experience, Allstate will help prepare owners for their careers–including licensing. Allstate also offers a Military Program for veterans. Click here for more information. For more information on all other positions, or becoming an Allstate licensed sales professional, visit their website. Woz U was founded October 17, 2017 by one of Apple’s founders, Steve Wozniak. Woz U seeks to bring opportunities in the technology field to the masses, provide quality education to their students, launch students into a technology field, create a community of developers who help one another during the program and beyond, and offer lifetime support to each of their students. John showed a video showing the success story of a Phoenix technology student who became homeless during his course of study, received assistance from the school, and went on to accept a great job as soon as he completed the Woz U program. Executive Director of Career Connectors Jessica Pierce closed the formal part of the meeting and thanked the host, Highlands Church of Scottsdale; guests including keynote speaker and hiring companies; and volunteers. She then invited attendees to take advantage of the breakout sessions: meeting with hiring companies and training resources, getting advice from resume writers and LinkedIn coaches, and receiving free professional headshots from the professional photographer on site. The next event for the Scottsdale location will be held Thursday, August 16, 2018, at 9 AM. For a complete list of events along with times, locations, and speakers, see the information to the right of this blog. Or go to the events’ section of this website. 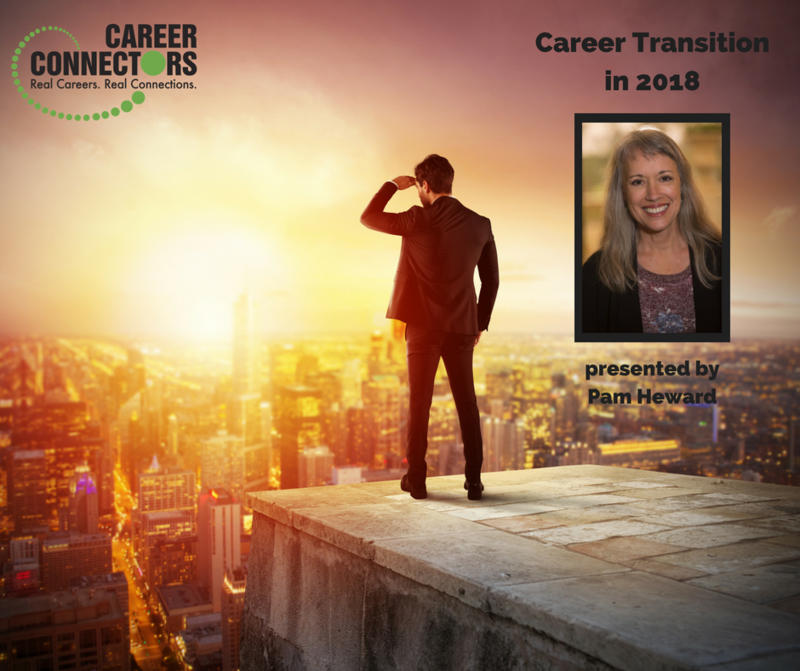 Pamela Heward is passionate about helping others through career and life transition as the owner and founder of Box Free Minds. She shared that a successful career transition is a combination of discipline, patience and creative thinking. The best place to begin is with your mindset. Eleanor Roosevelt said, “No one can make you feel inferior without your consent.” How you feel is something you control. 1. The WORK before the work begins NOW. Take the time to fine tune your resume, develop your LinkedIn profile, and network to get ready for the real work – finding your next opportunity. 2. Create your awesome list. You are more than bullet points on a resume. What are those things about you that are great, but don’t go on your resume? For instance, seeing things differently is not a problem. When asked what color a banana is, a younger Pamela said white. Most people think bananas are yellow, but when the banana is peeled, Pamela saw it as white. Seeing things others may have missed is a gift. What are your “white banana” gifts? Once you know this about yourself, you show up differently. You can talk about the skills that are more than bullets on your resume and how these gifts can be valuable to others. 3. There are 8 mind shifts that will get you unstuck and excited. One of the mind shifts Pamela shared is #6 – be an inquisitive explorer. You can get to know the market and industry through the Business Journal and other resources. Your responsibility is to find interesting companies that excite you. Put those companies on your target list. Prepare at least three examples of your successes. Once you develop your story, practice telling it. Your story should be one minute or less. Otherwise, you will lose your audience’s attention. The first time telling your story is always too long, so practice and rehearse out loud and with others. 6. Step outside your comfort zone, try new things, learn, grow. Pamela shared this quote, “A comfort zone is a beautiful place but nothing ever grows there.” – Unknown. Use this transition time to try new things. Get out of your comfort zone. 7. Talk with others. Don’t “firehose” people immediately. When you start talking with others, share your title and wait for their response. If they ask a question or are interested in what you said, provide a little more information. From there, the conversation develops. 8. Recharge your battery. Draw a circle with 8 pie slices on a piece of paper. In each slice, write things you can do when you need to recharge. This time should be healing and rejuvenating. Walk, enjoy nature, unplug electronics, play music, sleep, solitude, dance, talk to a friend are some of the suggestions from the audience about how they recharge their batteries. 9. Time blocking. Plan your week, but don’t put all your brain time in one basket. Most jobs are found through people you know, so get out there, meet people. If it will help you, turn your weekly calendar into an accountability partner so that you are accountable for the weekly plans you made. 10. Collaborate, connect, converse but NO Commercials. Recruit the best people to work with to maintain your spirits. Who are “your” people? This process isn’t all about you. You need others to help you. Also, be sure to grow and network even when you’re at your next position. BONUS: No guilt. Take this time to do something nice for yourself. Energy attracts like energy. Now you are ready to show up. Enterprise is a family owned company, so company values are important. Their mission statement is to be the best transportation company in the world; to exceed customers’ expectations for service, quality and value; to provide employees with a great place to work; and to serve their communities as a committed corporate citizen. The founder, Jack Taylor, served on the USS Enterprise, which is how the company got its name. People are promoted from within at Enterprise, which leads to an understanding of a variety of positions within the company as you move into different roles. The management training program requires a Bachelors degree. Each branch runs as its own profit center with 5-7 employees, and 100-150 vehicles. Resumes may be submitted at careers.enterprise.com. You may apply online at careers.nammotalley.com. NESCO Resource has more than 100 different clients that may be looking for your skills. Jobs change almost daily, so for the latest openings, check www.nescoresource.com. Or call for an appointment: (480) 898-9452 in the East Valley, or (623) 236-2074 in the West Valley. Know the name of the recruiter in the posting and which positions you are interested in. It’s helpful to meet your recruiter in person and stay in touch, at least once a month. State Farm is now hiring experienced software developers, infrastructure analysts, and systems/data administrators. To learn more about specific openings, visit www.statefarm.com/careers. On Thursday, June 21 at 9am in Glendale, Brenda Cunningham will be speaking about how to “Use LinkedIn in 15 Minutes a Day.” Hiring companies at that event will be Modis and Copper Springs. Also, be sure to check the schedule for the dates of upcoming June and July events at careerconnectors.org. A few dates have been moved to accommodate summer programs at our host locations. 1/11/18 – Finding and Landing a New Career FAST! 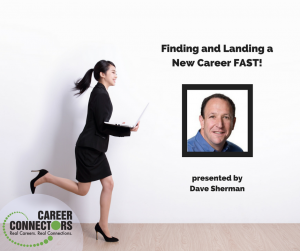 Finding and Landing a New Career FAST! Dave works for Mobile Mini, which is hiring, by the way. See those positions here. Step out of your box. Can you stay here? Look for the stuff you really want to do. Do you know what you are really good at? Gallup Clifton’s survey identifies greatest strengths. You can live your best life when you tap into your unique strengths. You can either pay the nominal fee and take the survey online: https://is.gd/zNzEJd or buy the book Strength Finders and get it for free. Tip 3: Start meeting MORE PEOPLE! To get into a new career or field, expand your network and the people you want to meet. You will need some assistance. Chambers: attend 2 events. No need to join unless you are starting a business. Come to meetings. Then when you get to where you want to be you can help others. Show up 15 minutes early. Bring business cards. If in transition get business cards with: name, phone, email, and if you want your LinkedIn profile. Make sure they’re not too thin. Ask for help! Let people know you’re in transition. When attending events let go of the outcome! Don’t expect to come away with something. Just see what happens. If you golf you may score an 83 and the next week 93. It doesn’t matter. Build more likability. Smile. Be genuine. Be interested, not interesting. Ask questions. How did you get into this field? If I wanted to get into X, what do you suggest? Build more commonality. Ask about their hometown, hobbies, school, family, friends, and favorites. Finding a new career is like a rollercoaster. Think of what a great opportunity you have. How long this adventure lasts is up to you. Do all this every day. This will go faster than if you spent the day looking at the job boards. Where you are sitting might be a little scary. If you can, take that one minute and say to yourself what might come out of this? Connect Wireless’ headquarters is in Scottsdale, with 80+ stores in 8 states and launching 8 new stores this month. They are currently hiring for a variety of positions, from Sales, to corporate positions: Commissions Assistant Auditor, Data Reporting Specialist, and Administrative Assistant/Operations to Lead Training Manager. A complete list of openings is here. Direct lender Supreme Lending has pretty much no middle-man. This privately owned and debt-free company started in 1999 in Dallas. Operations are in the main office off I-17. Supreme Lending doesn’t do reverse mortgages, but does all sorts of residential mortgages. They are a direct Lender to FHA, Fannie, Freddie, VA, and USDA. All are government down-payment assistant programs. They have a program that gets owners back into a home in under 30 days with a 580 credit score with FHA. Supreme Lending does no-cost moves for their clients. They are opening up 8 more branches and are looking for Branch Managers, Producing Branch Managers, Licensed Loan Officers and Assistants, and Processors all across the state from Tucson to Phoenix to Flagstaff. See all openings at Supreme Lending. Allstate has been around for 85 years in U.S. and Canada. They have 47 products, including financial services. They are looking for Agency Owners, IT, Product Management, Claims Analysts, and Licensed Sales Producers. In general, Allstate’s main focus is on the local community and servicing them. A big bulk of the business is their property and casualty line. Allstate assists employees with the cost of licensing. They have an active Veterans Program and are currently running a short hiring referral promotion. There are also 40 openings with their partners. Go to Allstate for more information. Ever had anxiety over having to change one of your many passwords that have become a part of life in our high tech lives? Ever worry about your kids, your spouse, and your bills? Ever get nervous when the boss invites you into the office at the end of the day? Ever get anxious when you think you’ve lost data off your computer? All reminders that anxiety, stress, worry, fear, have become part of our modern day life. So, is it any wonder that a job hunt or job transition provokes anxiety? But there is hope for managing high anxiety which is often part of that job hunt. “One of the great conundrums of job hunting. You feel lousy after a bad interview.” Then after a good interview you feel upbeat, even great, and start making plans. “And then the rejection (or the no-contact) makes you feel lousy. So just in general, you feel lousy all the time.” You feel anxiety. Andy Gray, who has been on both sides of the interview, is here to remind job searchers that even though anxiety is almost certainly a part of any career search or job transition, if we’ve worked at other careers, other jobs, then we’ve experienced our share of anxiety there, too. Andy wants to give job searchers hope by offering tips on handling the anxiety and stress inherent in job searches and compares that anxiety to handling anxiety on the job—they’re similar and they are controllable. With over 35 years of experience working in marketing and communications, Andy’s expertise has helped him mentor and guide people seeking career change. Andy broke into his current career in coaching and mentoring when he helped one of his sons who was just getting out of college to manage his job search. Andy helped his son with the process involved in landing a job. Based on his own career experiences, and his background in marketing, Andy advises job candidates at all levels to think of themselves as their own product they’re marketing. Think of your last job and how much time and effort you spent. Apply that same concept in your job search. Be prepared to write down your goals and strategies, not just think about them. There’s power in writing it down. When Andy learned famed Dallas football star Emmett Smith wrote down his goals in football every year, Andy started writing his goals every year, too. The entire process of the job hunt strategy — including preparation, practice, positive attitude and respect for the job search — will help reduce anxiety during the job search. Devote as much time and work as the projects you managed or participated in –projects that went well and that you were proud of. Didn’t these positive outcomes give you confidence? Write your introduction and background. Create your personal brand. Personal branding is the practice of people marketing themselves and their careers as brands. Personal branding is the ongoing process of establishing a prescribed image or impression in the mind of others about you. You’re being judged every day in your job hunt, so you need to be in A game all the time, just as you would adopt that attitude in any paid job or project. Prepare to talk about tangible experiences, strengths, and areas of improvement you desire (aka “weaknesses”), presenting areas desired for improvement in the best possible light. Don’t just think about what you’re going to say, practice it, whether it’s online, with your cell phone, with a friend, or in front of a mirror. Practice 30 and 60 second messages. Prepare for information meetings, not just interviews. Practice dressing the part and practice stance, walk and sitting. Even on the phone, dress up! Videotape yourself. Ask yourself how much work and time did you devote to projects you’ve managed? Replicate that effort in your job hunt. Nothing happens easily. Plus consider the other side of the job hunt—the hiring manager. What you think isn’t necessarily what the other person thinks. Be positive through research. Get to know more that just the company culture before applying. What’s their hiring process and interview questions, who will you be meeting, latest industry and regulatory trends, and the latest company trends and SWOTS (strengths, weaknesses, opportunities and threats, four elements of an organization, project, or business venture). Do your homework, adopting the mantra to underestimate and over deliver. Remember your resume will face a lot of competition. 1000 individuals will see a job post. 75 of those 100 resumes will be screened out by either the TS or a recruiter. Tip: Many ATS systems may not be able to scan and read PDF files. Only 200 seconds to receive the 1st resume after a position is posted, only 17% of recruiters read cover letters, 61% of recruiters reject resumes with typos, and unprofessional email addresses will be rejected 76% of the time. Consider this: Deloitte, a top accounting firm, brags it only hires 3.5% of applicants. And Google gets over 1M applicants per year. During its robust hiring periods, they hire 4000 people 4/10 of 1%. Remember, in life and in the job hunt, some days don’t go well. It happens. So, move on. But move on confident you know how better to handle anxiety of the hunt. Waste Management, located at I-17 and Bell, employs 1500 people and boasts 25 million customers. Concerned with sustainability, the company is the leading provider of comprehensive waste management services in North America, providing services ranging from collection and disposal to recycling and renewable energy generation. The company maintains a low attrition rate and attracts qualified talent, including their leaders. They strive to keep their existing customers while continuing to bringing in new business. Career areas include transitioning military, programs for college grads, experienced professionals, front line operations, and internships. Specific openings include Inside Sales Rep, Account Manager, Collector and Customer Service Rep. Advantages of working at WM include laptop, cellphone, vehicle reimbursement, plus comprehensive health care benefits, 401K and more. To learn more about the company and specific positions available, and to apply, visit their website. The Hartford is a leader in property and casualty insurance, group benefits and mutual funds. Employing 18000 employees, the Phoenix site employs 500 people who handle personal lines operations, groups benefits operations, auto claims, property claims, workers compensation claims, general liability claims, auto bodily injury claims and commercial claims. Voted the World’s Most Ethical Companies by Ethisphere Institute for the ninth time, they’re also among the top 100 companies for remote work, at 35%; other awards include diversity innovation, best employer for healthy lifestyles, military ties best for vets and corporation of the year by Latinas & Power Leadership. Service center job opportunities include customer payment associates, customer service consultants, and customer sales representatives. It’s not a call center but instead a very professional service center where the focus is not on how long you’re on the phone but instead the quality of the service. The company offers fulltime, part time and flex schedules. Benefits include comprehensive healthcare starting on day one, 19 PTO days per year plus 8 company paid holidays, health savings account, tuition reimbursement, wellness initiatives to decrease healthcare premiums, and life insurance. To learn more about The Hartford, visit their website. NESCO Resource, a temporary staffing company since 1956, has gradually grown from IT to service a wide range of industries through a branch network and national recruiting centers, and supports Engineering, IT, Administrative, Industrial, and Accounting & Finance specialties. Winning a number of awards, its parent company NESCO, is a Fortune 1000 company. Ranked as one of the fastest growing US staffing firms, they have over 90 branch offices including Peoria and Tempe. Current NESCO Hot Openings including professional, clerical and industrial. If you see an opportunity, call to speak with a recruiter and they will schedule an appointment. Keep your resume updated including volunteering but be prepared to customize. NESCO benefits include the chance to test out the culture of companies, health/welfare benefits and benefits specific to the assignment. To apply call for an appointment, or visit their website. State Farm, a stable insurance company in business for 95 years, has a mission to help people manage the risks of everyday life, recover from the unexpected, and realize their dreams. Not just about selling insurance, the company offers jobs in many areas including immediate and ongoing opportunities of claim associate, CCC sales rep, CCC service rep, State Farm Bank, and Systems/IT. Experience, including legal, is needed in the area of claims, property, total loss and injury. Benefits of working at the Tempe location include their Marina Heights facility — a two million square feet area, 8000 employees, with retail space including Starbucks, Matt’s Big Breakfast, Mountainside Fitness, Honor Health, Grab-n Go, with more on the way. Job opportunities include accounting, administrative support, claims and investigation, customer service, facilities management and administrative services, legal, compliance and risk management, human resources, marketing, research and analytics, sales support, technology and sales experience, and underwriting and actuarial. Feel free to visit the Tempe site which is open to the public. For more information or to apply, visit their website. You may also apply online to open positions, and you may apply using LinkedIn. Coder Camps prepares individuals to become web developers. Coder Camps has campuses in Scottsdale and Seattle. It’s a fast-growing, understaffed field. They teach full-stack web development and partner with their students to find work within the field. With training and five years’ experience a coder can earn $100,000. Coders are so needed that it’s also been impossible to keep up with the need for trainers for these camps. Currently 223,000 coder jobs are available that go unfilled because there are not enough people trained for this field. You need little or no training in coding to attend a boot camp. Currently, there’s also a huge push for women in this technological field so $2000 scholarships are available for women. A 12-week coder camp completion also means free ongoing training for life. For more information or to apply, go to their website. Executive Director of Career Connectors Jessica Pierce closed the formal part of the meeting. She thanked volunteers and the beautiful facility, Highlands Church, for hosting the event. Attendees were invited to fill out forms to apply for gift cards, available based on income, courtesy of Highlands, for individuals in career transition. Jessica reminded everyone that they are all eligible to take the DISC assessment free through the Career Connectors website. During breakout sessions, all in attendance have a chance to obtain assistance in LinkedIn and resume writing; to have a professional head shot taken; and to speak with hiring company representatives. Please note: Because of church scheduling, the next Scottsdale event of Career Connectors will be held on the third Thursday of June – June 22, 2017 — rather than the second Thursday. Keynote speaker will be Jean Briese, speaking on the topic of Discover and Unleash Your SuperPower. For details about times, dates and topics for upcoming events, click here. Parting Thought: Check out on You Tube So Much Anxiety by Standup comedian Aparna Nancheria.